With the final stages around the corner Peterite Lakshina Rodrigo and Richmondite Charith Asalanka arestill going strong occupying the first two places in the platinumcategory in the division one school cricket tourney at the end of the12th week count of the Sunday Observer/Mobitel Mostpopular Schoolboy Cricketer Of The year contest. Peterite Rodrigo polled in 23241 votes to Charith Asalanka's 19508 in the platinum. 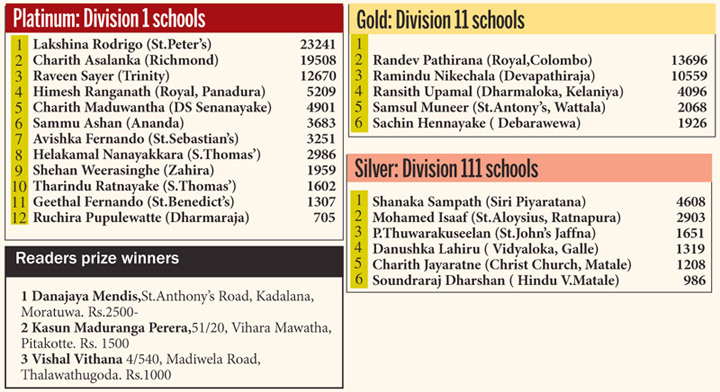 Whil;e RandevPathirana maintained his top poisition in the gold category with13696 votes. Ramindu Nlkechala of Devapathiraja Ratgama is insecond place with 10,559 votes.